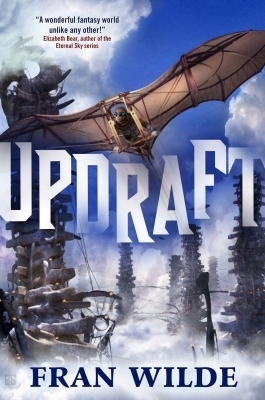 Updraft is a YA crossover novel that sends readers on a journey beyond the clouds and into a richly imagined world of open skies, towers and wings. The story follows a young woman named Kirit Densira who lives with her family in one of the many skyward bone towers that make up the city. She dreams of one day becoming a sky trader, but to do so, first she must pass a trial to earn her wings. However, the status of every citizen is determined by which structural tier you occupy, and no matter where you’re from, chances are you’re at the mercy of the Spire, the tallest and most powerful tower located in the heart of the city. The Spire has the final say in all matters and uses its secrets to change history and keep the other towers under their thumb. An individual tower’s prestige and benefits are determined by a special class of law makers and enforcers called Singers, whom citizens both revere and mistrust. Citizens are allowed to challenge Singers, but the results are often rigged against them. The Spire will also make the other towers pay by making examples of their lawbreakers, sacrificing them in very public displays. Citizens are not only expected to accept this, they are also expected to be thankful. Not surprisingly, the main antagonist is also the most influential Singer, a dictator-like figure who has everyone in his pocket, and of course he’s out to use Kirit for his own means. Just three challengers this week, so picking my favorite was pretty easy. It’s definitely not the Tor Hardcover. I have to say, I’ve always hated that cover. It’s awful. The character has the most ridiculous expression on her face, and at first I thought all that cloud was snow. The other two choices are much better. In fact, I was really happy when Tor gave the book a new look when it came out in paperback. 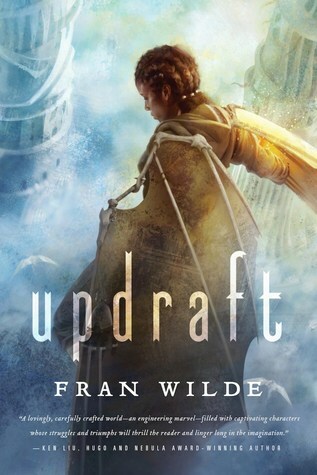 Aesthetically, this cover is much more pleasing to the eye, with its soft colors and a superb perspective showing Kirit perched atop a spire and gazing into the depths below. It’s so well done, just looking at this image gives me vertigo! That’s my pick for sure. Ooh clouds- cool category. I like the one you picked too- the feel of her looking down from a great height, really works on that one. Yep, it’s all about the angle! I love it! Yes. I thought this cover was the best too because it shows her in the clouds fairly high. So that’s my choice as well. Yes, that perspective really emphasizes the great height, which is what I loved best about this cover. I’m glad! I think it’s a really great idea too, and kudos to the creators. It’s my favorite meme to do. Haha! Yeah, the person on original cover is a tad androgynous on account of those huge goggles. I like the German edition best. It appeals to me visually! 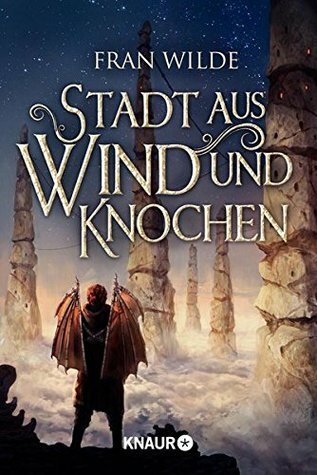 I think the German cover is very pretty too. The Tor paperback only beats it because of the cool angle. You and Tammy were definitely on the same wavelength today. I think all three are really good covers but I think I favor the Tor hardback – but only by a slight margin. Haha, yep, Tammy and I were FF twins today! I love the Tommy Arnold cover, of course. Also, love this book! Good pick! Oh so he’s the artist! Good to know! The german one looks like a cover for a video game. It does have that feel to it! We’re twins today, which doesn’t surprise me😁 Of course after my post went up, I realized Cloudbound would have been a better choice, lol. Oh yes, I guess I should have mentioned that all the tech in this world is made of bone-like material! And yes, I love the expression on the girl’s face in that cover too! It’s a very humbling look and pose. Yes, ironically, I feel the original one is the least impressive of the lot! I like your choice of cover. I really don’t like the hardback although I think the German cover is a close second.